Since I live in the south, lots of menus around here have something called a Po Boy. For those of you who call it something else, a Po Boy is a sandwich that is loaded with fried shrimp, oysters, chicken, or other fried goodness all on top of a French baguette. Of course, there’s a few veggies in the sandwich underneath a sauce. I guess it’s sorta like the Louisiana version of the Philly Cheesesteak. Not the best thing to be ordering for your health, let alone if you’re trying to stick to a resolution. Fear not, there’s plenty that you can do to a Po Boy to make it more reasonable but not give up that flavor or the sauce. A really hot oven combined with a little bit of non-stick spray and cornmeal can do wonders. Preheat oven to 450 degrees and place a foil lined cookie sheet inside while the oven preheats. In a small bowl or plastic container, mix the almond milk, lemon juice, mustard, mayo and pepper until smooth. Set aside. Slice the hoagie rolls down the middle and fold open like a hot dog bun. Remove the tails from the shrimp. Remove the cookie sheet from the oven and spray the foil lightly with non-stick spray. Place the cornmeal in a baggie and add the shrimp a few at a time. Toss in the baggie until coated with cornmeal and lay out on the cookie sheet. Repeat with remaining shrimp. Spray the shrimp lightly with non-stick spray and bake at 450 degrees for 8 – 10 minutes until browned. Remove from oven. Divide equally onto the hoagie rolls. Top with sliced tomato and spinach, as desired. Drizzle the sauce evenly over top. 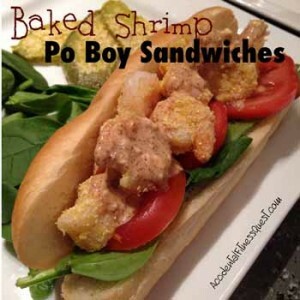 Makes 4 po boy sandwiches at approximately 335 calories each – 27g protein, 44g carbs, and 8g fat. I used the pre-cooked shrimp from the frozen section at Walmart since they are so easy to use and make putting this together quickly. I just thaw, remove the tails and use. You can do this with raw shrimp but make sure to adjust your cooking time accordingly. The hoagie rolls I used were approximately 6 inches long and 180 calories each. They were from the bakery section at the grocery store here. I’ve also seen pre-packaged ones in the regular bread section. In a pinch, you can use hot dog buns, bread or sandwich thins. Your calories will obviously change depending on what you use. The po boy is pretty reasonable in calories. If you are still looking to cut back, you can hollow out the hoagie rolls a bit to remove the excess bread. This will cut about 1/3 of the bread calories without sacrificing the taste of the sandwich. Save the insides for croutons or breadcrumbs. I had leftover cornmeal so I tossed a few dill pickle slices in the baggie and added those to the cookie sheet with the shrimp for a few baked fried pickles. The fried pickles were good on their own but amazing on the Po Boy itself. Do they have a version of the Po Boy near you? What’s it called?